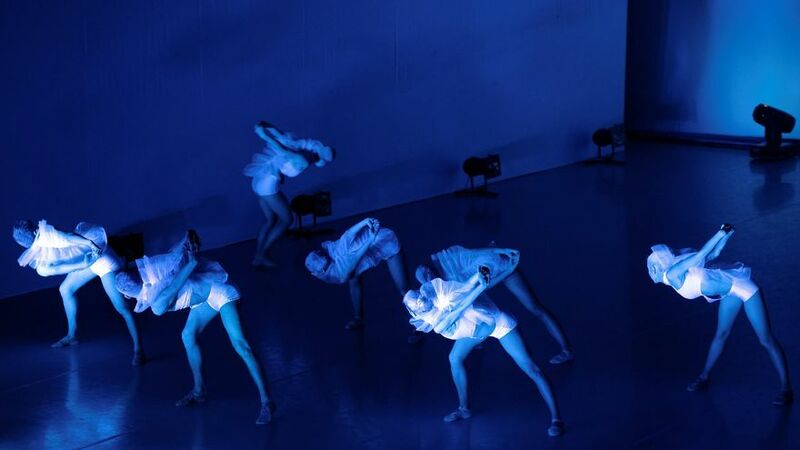 “Another World” is a contemporary ballet performance, in which Depeche Mode’s world famous “Another World” tour meets the writing of Japan’s most famous novelist Haruki Murakami. This dynamic marriage of text and performance takes in both H. Murakami’s “Hard-Boiled Wonderland and the End of the World” and Depeche Mode’s brilliant flair for music and image. Laurel of the performance rightfully belong to the director and choreographer Marija Simona Šimulynaitė and all dancers of “Baltic Ballet Theater”. It is a young, ambitious and talented team, established in 2010, formed by young potential artists who studied abroad, yet have a desire to work and create in their native country. The “Another World” performance is inspired by symbols, philosophy, visuals and, of course, energetic music. The sound evokes the movement, and all of this transport spectators to the world of dreams, lights, lasers and visual projections. Dancers become androgynous mechanical creatures diving into the space of mutant dreams and synthetic feelings. The futuristic performance exhibits a surreal world where there is no more space for natural feelings nor an acceptance of reality. People communicate, laugh, express their anger and even reproduce themselves not because they want to but because they have to do so. It is a world where there are no more true male-female relations – everybody looks alike and prefers hiding behind masks and faking emotions in order to avoid being hurt. In such a situation as this, we can only dream of a real, natural and free state. As the words of the Depeche Mode say: “Dream On… Dream On…”. The entire dance performance is like a constantly disinfected and sterile incubator, where people, their psyche, needs, and emotions are controlled by the invisible and governing “hand of the system”. Individual needs and desires are irradiated and destroyed by chemotherapy lamps. The alarm immediately goes on if there is just a slight search for naturalness, and the feeling is destroyed. It is a laboratory of mind-numbing, where we are the biochemists. Mainly, the old songs of “Depeche Mode” are used, because they have much less pop sound. Also, the stenography of “Another World” uses seven different projectors that create a completely different dimension on the stage.